Wedding announcement template is the thing you can take when you want to publicly proclaim the marriage that will take place in church or in municipal hall. 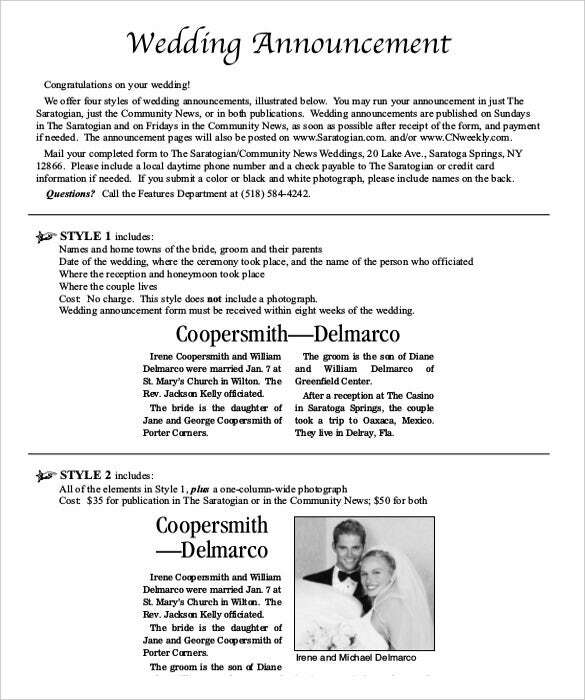 Similar to Wedding List Templates in sample format, you can have it posted or printed where the announcement of the wedding day or have the newlywed a congratulation message that will be seen by the masses. 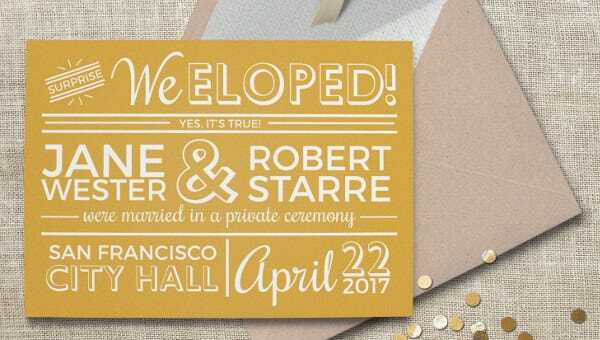 If there will be new proposals or notes you want to add in the banner then it is no problem in these Wedding Templates as it can adopt in any situations. 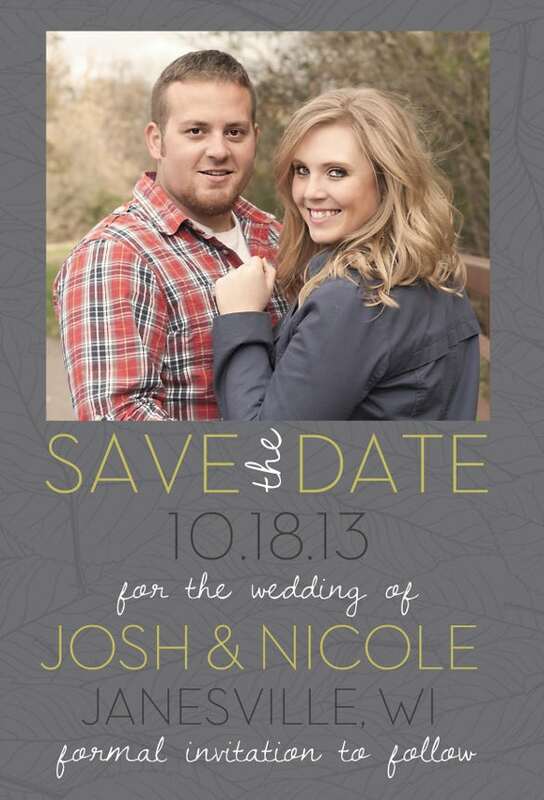 You can have it in your own way where all of the people will see the message for the upcoming wedding. 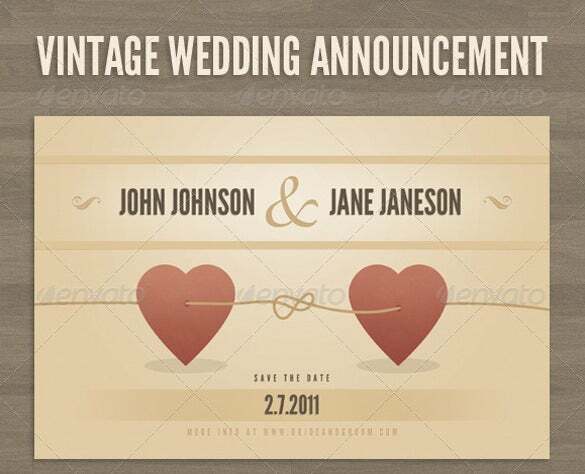 This simple wedding announcement card template is designed in retro and vintage style and is an ideal to let the world know about the surprise wedding. It comes with print ready JPG or PDF file that can be easily customized with photo, text, color and sizes. 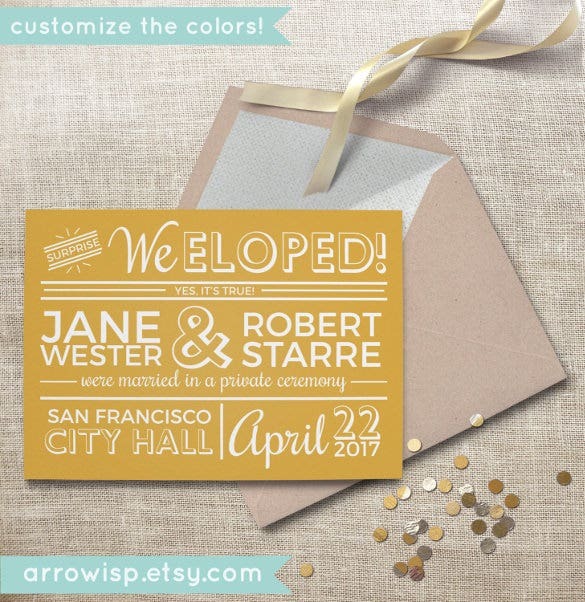 This excellent template is a double sided flat card that is perfect for making just married wedding announcements, elopement or destination wedding. 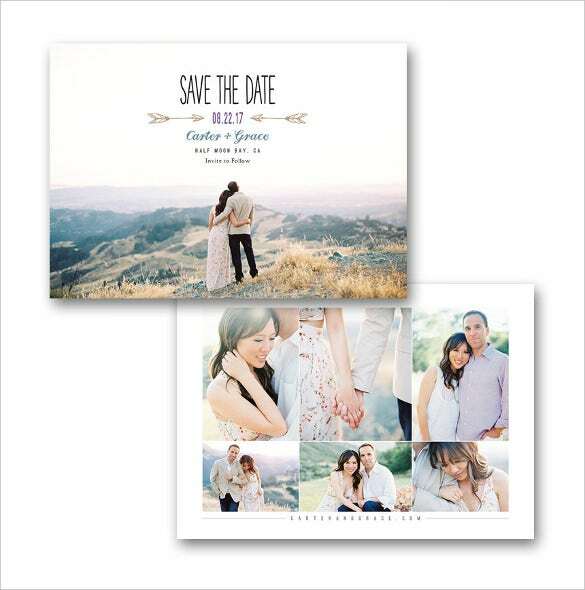 It has a 80 lb cardstock and all colors, fonts and wordings can be easily customized with photos on both the sides. 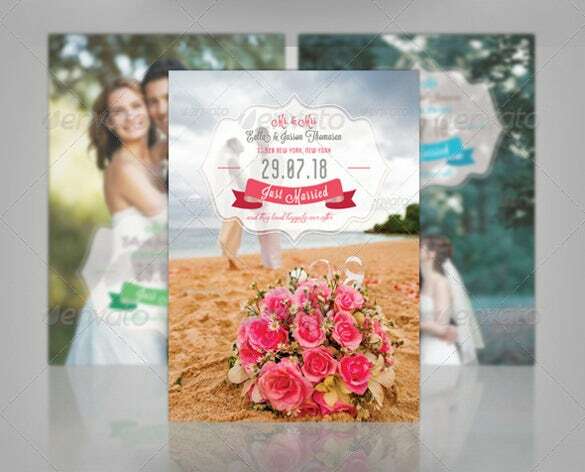 This great wedding invitation editable template is a ideal way make custom wedding announcement cards in portrait or landscape layouts. It comes with 12 unique paper styles, 2 printing options and 6 shape options and easy provisions to add photos and texts to both the sides of the card. This attractive wedding announcement card template is a perfect way to design customized cards with personalized texts and colors. The Zip archive includes 3 EPS 10 files for Adobe illustrator, 3 PSD files for Adobe Photoshop and 3thumbnail JPEG files. 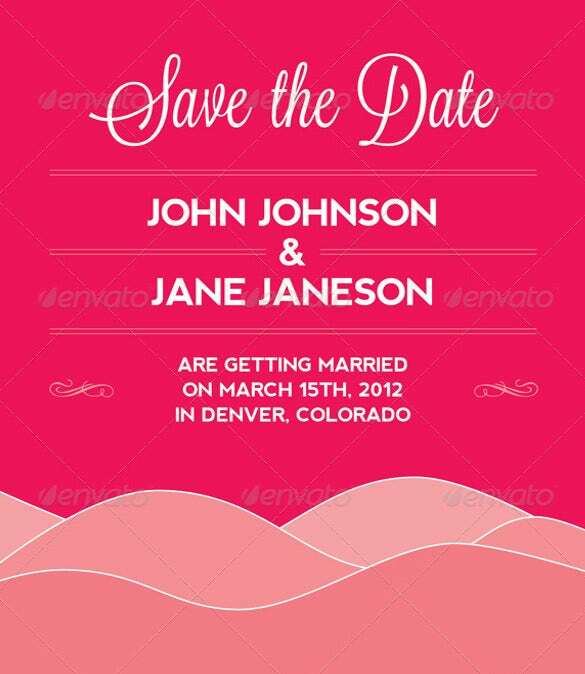 This elegant wedding announcement card template is extremely simple way to announce wedding ceremony details to the friends and relatives. This free to download golden wedding announcement card provides the important details of the marriage in a single page with minimal designs. 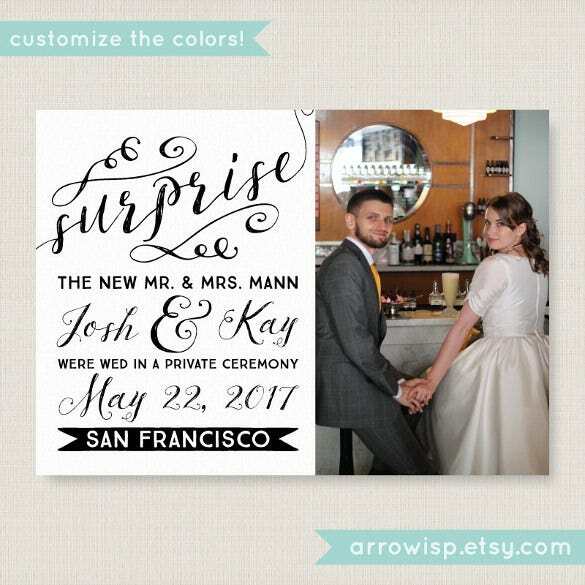 This great wedding announcement card template is a ideal way to announce the world about a surprise wedding with custom announcement cards. It comes in a print ready PDF or JPG file that allows the users to personalize the card with photos, text, color and size. 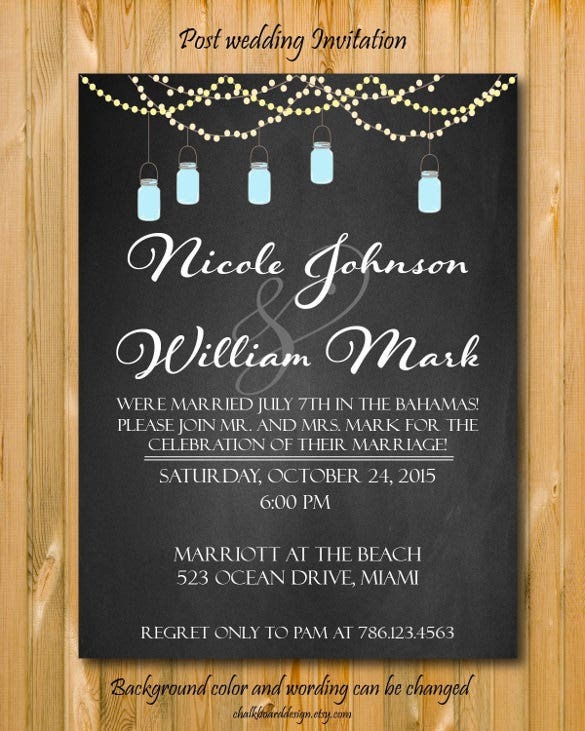 This elegant wedding invitation template is editable easily by allowing additional classy texts and touches to the wedding announcement card. This easy to modify, layered card template includes Photoshop PSD graphic files and has 5”x7”, CMYK specifications with croplines and color bleeds. 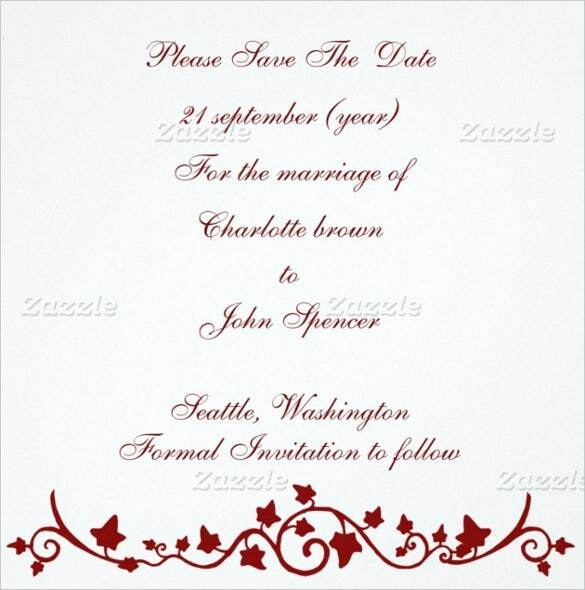 This red mod save the date announcement card template comes with 12 unique paper styles, 2 printing options and 6 shapes options for easy customization. 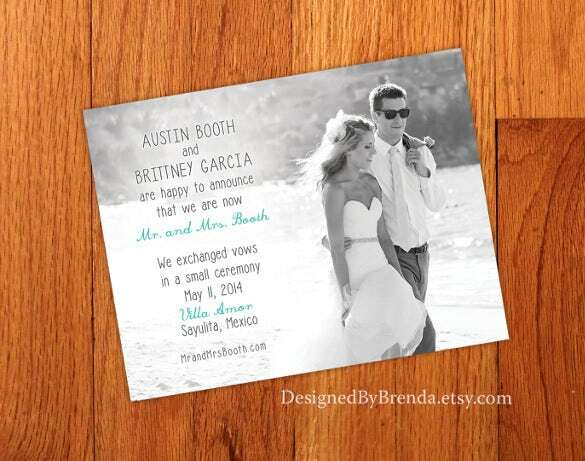 It has 2 types printing options and allows users to add photos and text to both the sides of the flat card. This stylish wedding invitation template has free download provision and is a unique way to customize the wedding announcement cards. 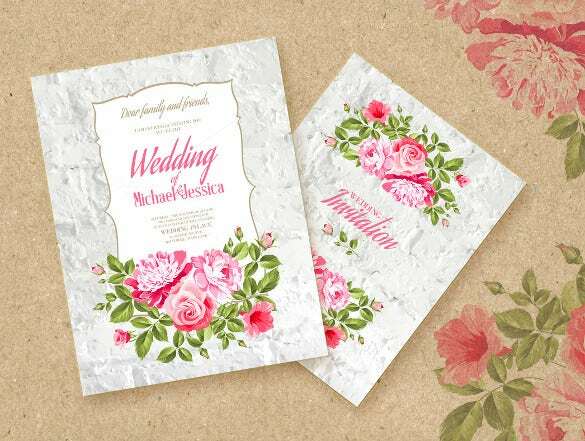 It allows the users to create personalized wedding invitation card by adding the lovely picture of the marriage couples with custom texts. 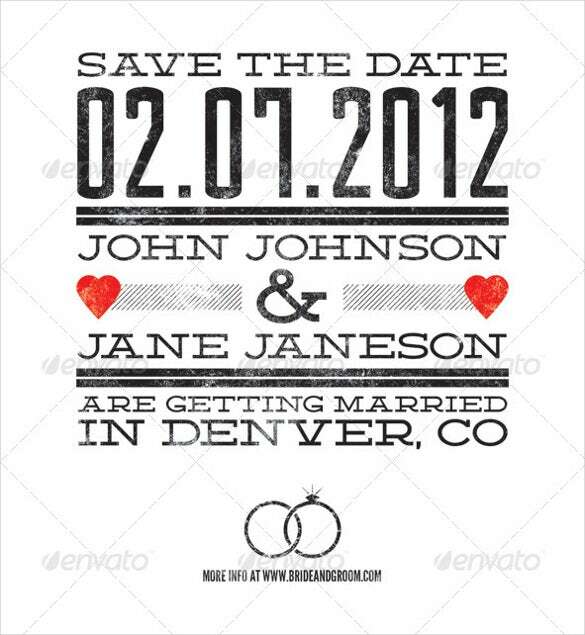 This excellent wedding announcement card template is a perfect way to inform the world about the just married status of the couple with their wedding photo. This fully editable template has 300 DPI, CMYK print ready specification and it is available in vertical and horizontal version. 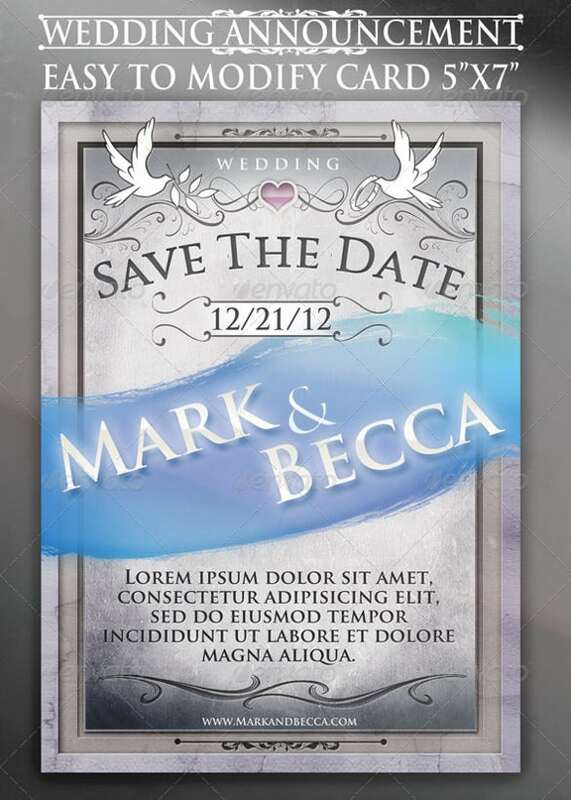 This modern template is a great way to customize the wedding announcement by designing a elegant photo wedding invitation. Users can customize the card with their preferred colors and wordings that can be easily printed in a local photo lab. 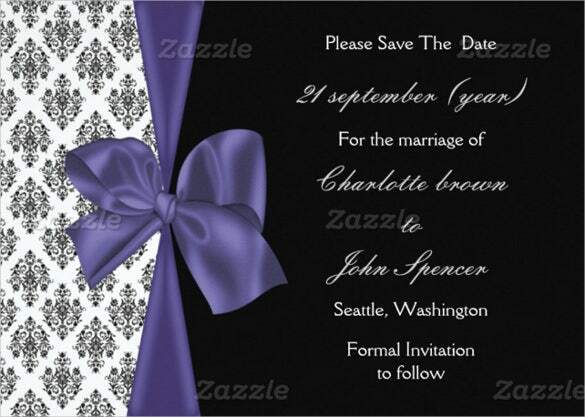 This attractive wedding announcement template with violet color ribbon design provides a rich look to the wedding invitation cards. 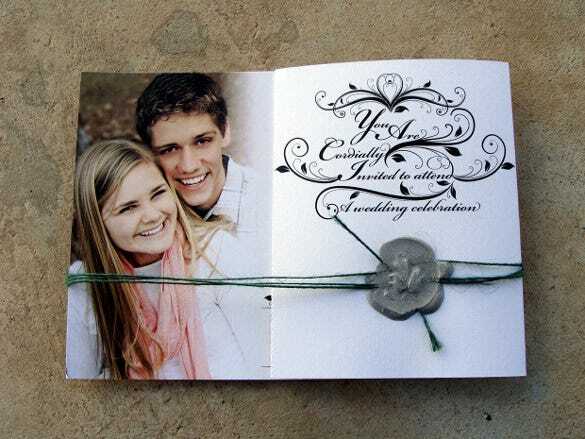 It is easily customizable with 12 unique paper styles, 2 printing options and 6 shape options and photo adding provisions in both sides of the card. 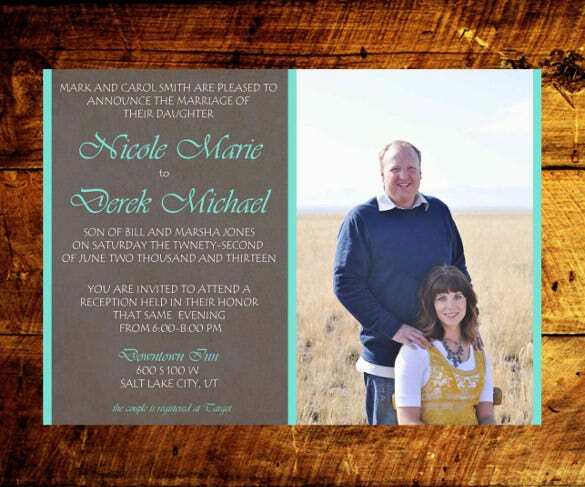 This simple wedding announcement card template is ideal way to design a personalized wedding invitation card by instantly downloading the template. 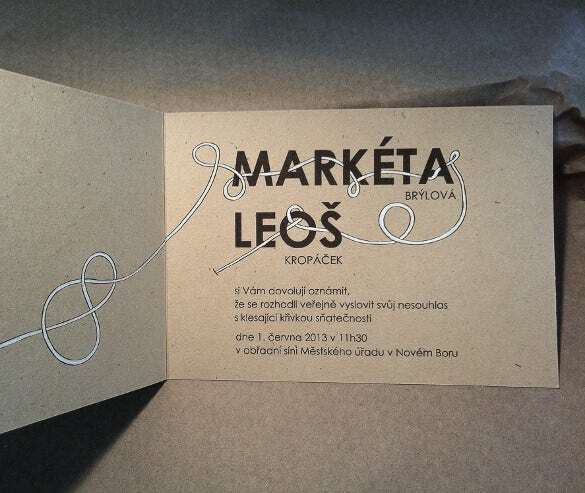 It has attractive fonts, cute images and lovely design with necessary details that make it completely unique. 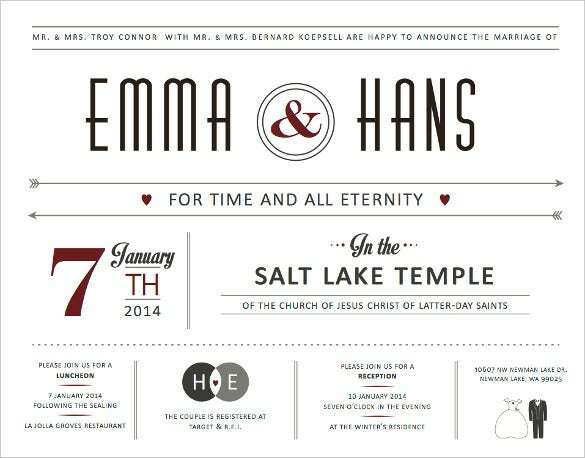 This clean wedding announcement template comes with minimalist design that is available for free download. It has 4 layout options including postcard layout and full bleed black photo layout option and is easy to customize all colors, text and graphics. 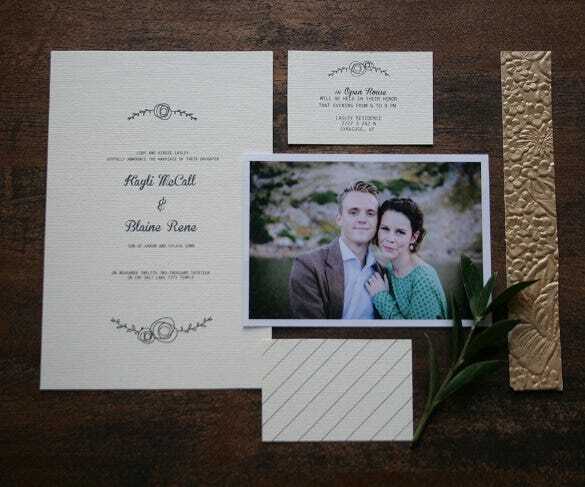 This stylish wedding announcement template is completely customizable and is ideal for printing the invitation cards either at home or local photo shop. This layered template has 4 different fonts, Photoshop file, 5.5”X8.5”, 125” Bleed, 300 DPI specifications and Photoshop PSD graphic files. 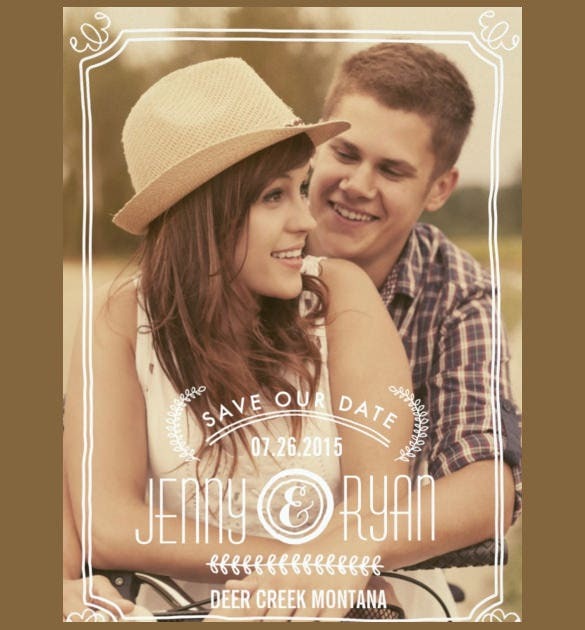 Wedding announcement templates are extensively useful for the couples to design a personalized wedding announcement banner to proclaim their friends and public about the upcoming wedding. These variety of templates are extremely editable with their preferred wordings, photos, and colors that can be easily printed a home printers or done professionally In a local photo shop.